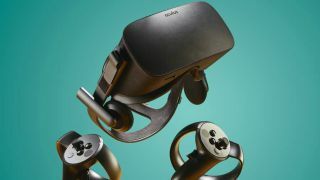 The rumored Oculus Rift S virtual reality (VR) headset reportedly has rather minor upgrades in the works so far, further affirming rumors that the device will not focus on visual experience upgrades but rather quality-of-life improvements. UploadVR reports to have found evidence of this within the Oculus PC app’s user interface code, first quoting references to a setting that would allow the user to choose between 50Hz and 60Hz room lighting as well as automated function for this setting. Described as “lighting frequency for Rift S cameras to adjust to room lighting,” this suggests that the Oculus Rift S will handle its own positional tracking via built-in cameras much like the Oculus Go of 2018. UploadVR goes on to detail that this new headset will likely remove the physical dial that adjusts inter-pupillary distance, or the space between the centers of your eyes, in lieu of a software control. Without this physical lever, the headset would have to either include a motor or adjust the pixels on the screen to match the unique distance between each users' eyes. It’s unknown both to this outlet and to us why Facebook and Oculus would make such a change when the upcoming Oculus Quest standalone headset maintains the feature. Of course, Oculus and Facebook declined to comment on the matter. These new details help affirm earlier rumors that the Oculus Rift 2 that was supposed to be the company's true next phase in PC-based VR is cancelled. They also lend credence to the reports that Oculus co-founder Brendan Iribe left parent company Facebook over the rumored cancellation of his Rift 2 project in favor of this smaller revision. For this Oculus Rift S, the adoption of internal positioning cameras would be a major quality-of-life improvement for existing fans and far less intimidating to new users. However, we would adjust our expectations for a knock-out VR experience if and when Oculus Rift S sees the light of day.